Perfectly designed for cutting small logs and extending limbs from trees, Sun Joe SWJ803E-CMO Electric Pole Saw is the ultimate tool you’re looking for. One of the main reasons why it’s so effective is its lightweight telescoping pole. It can easily extend up to 7.2 feet, which leads to a maximum of 14-foot reach. When it comes to precision, the feature that ensures this factor is the tool’s head which can be adjusted to different angles. It can go from zero to 30 degrees. More importantly, this small pole saw is surprisingly powerful. 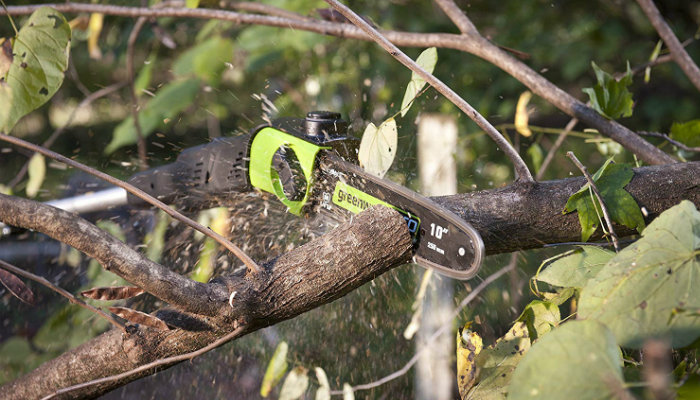 It has an eight-amp motor that can cut thick branches measuring up to 9.5 inches. You can even control its power just by pressing its button once. More about the motor, it can work for several hours. This is perfect for big properties with lots of trees. Of course, we should also focus on the chainsaw itself. It has a 3/8-inch chain pitch. In addition, its 10-inch Oregon cutting bar and chain have an automatic lubrication feature. Meanwhile, if you’re not really an expert on tools, you might appreciate the fact that assembling this product is a breeze. You just need to learn the proper installation of the bar and the chain. As a plus, since this is an electricity-powered tool, it only needs minimal maintenance. You don’t have to learn how to manage a gas-powered machine anymore. This option is definitely best for beginners. And last but not least, for the sake of your safety, this pole saw has a special switch that can stop an accidental start. 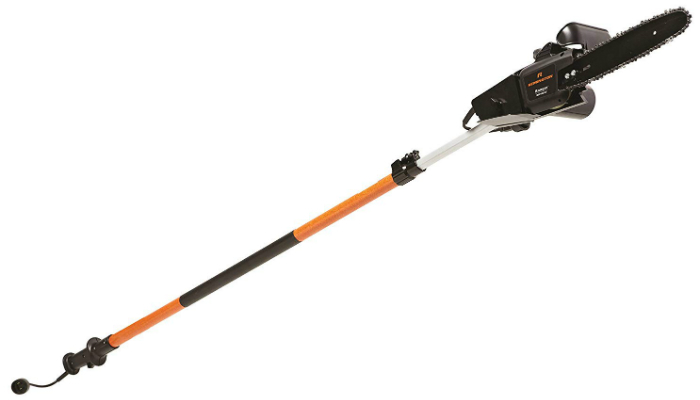 Durability is one of the best qualities of Worx WG309 Electric Pole Saw. It has a special automatic system for chain tension. This results in a longer-lasting bar and chain. Another tool with an eight-amp motor, this pole saw will constantly give you a powerful performance. It even has a 120-milliliter oil tank, which is enough for simple pruning. As a plus for convenience, the handle can smoothly rotate for better control. The eight-foot pole also promotes quick assembly since it doesn’t require tools for installation. 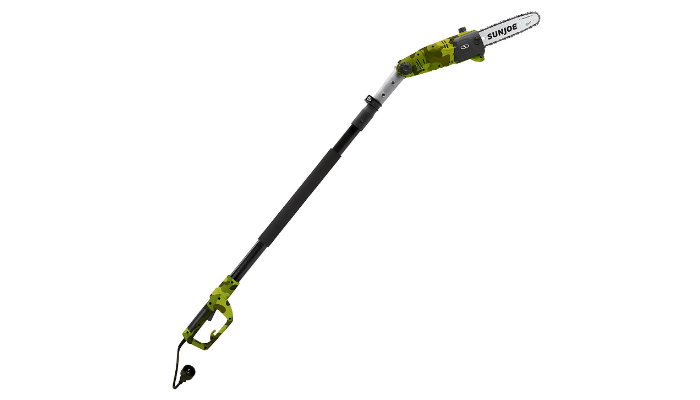 Just like the top product, Greenworks PRO PS80L00 Pole Saw also has a 10-inch bar and chain. It can cut thick branches, too. This option has automatic lubrication as well. It specifically includes an oiler that can supply oil to the bar and chain without requiring manual commands. Additionally, the tank is translucent for a quick refill. The highlight, however, is the tool’s brushless motor. It can provide a maximum of 30 percent additional torque. This is a big deal to boost power. 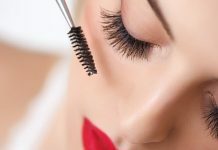 How cool is it to buy a multipurpose product without spending a lot of money for it? 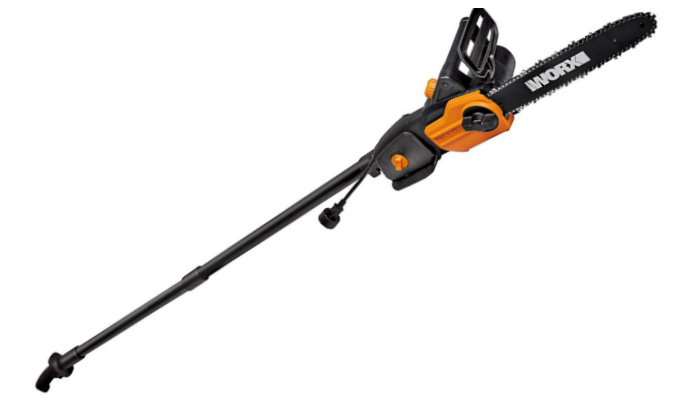 Remington RM1025P Ranger Pole Saw can effortlessly change into an actual chainsaw. Just separate the saw and the pole with your bare hands. Speaking of the pole, it is paired with flip-and-lock clamps for easier adjustment. This clearly increases efficiency. Meanwhile, for safety, the saw is less likely to make a kickback. It will remain steady as you cut branches. To increase stability, the pole won’t rotate during the process. Aside from affordability, the best pole saws for the money generally represent power and convenience. However, you still need to know the specifics to really understand what makes a good pole saw powerful and user-friendly. Learn about type, reach, versatility, and comfort. The major variations of pole saws are electric, cordless, and gas-powered. 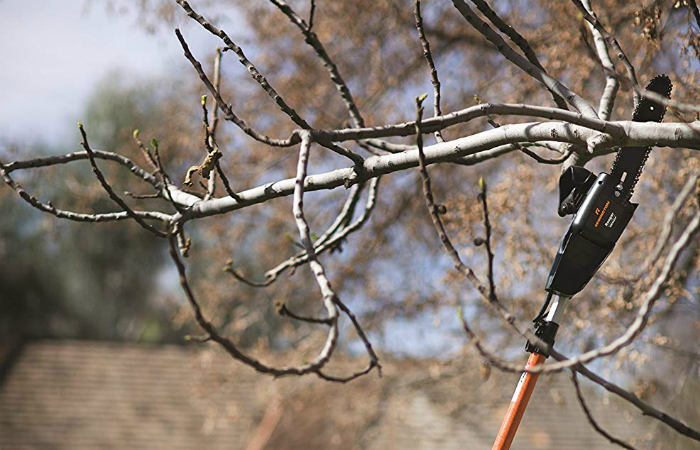 Out of the three types, electric pole saws are the best for budget-conscious homeowners. For starters, electric pole saws are the most lightweight. Even though they are weaker than gas-powered ones, they’re still powerful enough to cut thick branches. The ultimate disadvantage of electric pole saws is their cord. They rely too much on power outlets. That means they can only work in small areas. 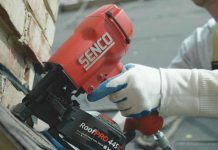 If you’re going to work in a bigger area without resorting to gas-powered pole saws, the cordless type is what you need. It only requires rechargeable batteries. 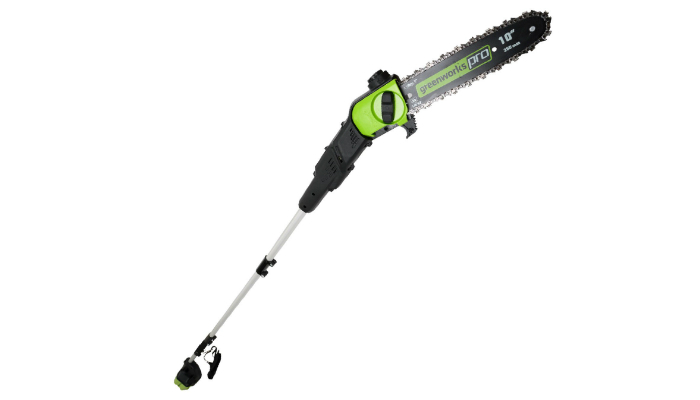 However, cordless pole saws can be heavier than electric models because of the added weight of their batteries. They’re usually more expensive, too. Despite their noise and bulkiness, gas-powered pole saws will always be the most powerful type. They’re perfect for professional use, especially in remote properties with several big trees. We’re not talking about the pole’s length. Reach refers to the combined length of the pole plus your arm. It is typically indicated as “working height” on the product’s package. Now, the logic here is obvious and simple – the longer the pole, the better. If you’re curious about the standard length, it’s seven to eight feet. We also highly recommend telescoping poles to really maximize your reach. Besides, they’re easier to control since extra-long poles will easily wobble in windy days. In order to cut a wide variety of trees, you should consider the cutting bar’s length. Longer bars can handle thicker branches. While the standard is eight inches, there are a lot of pole saws with 12-inch cutting bars in stores. Another feature that can enhance the versatility of a pole saw is the removable cutting head. It allows the tool to serve as a handheld chainsaw. It may turn out smaller than a regular chainsaw, but it’s still useful for turning branches into firewood. The obvious factor for comfort is weight. A lightweight pole saw is less likely to strain your arms. What we’re going to highlight, however, is the non-slip grip. This feature can improve efficiency due to better control. If you finish the task faster, you don’t have to raise your arms for a long time. Out of the best pole saws for the money, Sun Joe SWJ803E-CMO lands the number one spot. It is just a simple electric pole saw, but it’s packed with power. To maintain the pole saw’s chain, check out some ideas from our tips about proper cleaning of chainsaw chains. We also have an interesting discussion on how to measure them for replacement. If you need to cut down a tree instead of pruning it, learn the safety procedures for this serious task. Best Grill for Apartment Dwellers: Which Should You Buy?